Memory Combo is a blend of remedies to support memory functions. Use Memory Combo for poor concentration, poor retention, forgetfulness. Memory Combo offers a synergistic blend of remedies for brain support. A unique formula only from ELIXIRS.COM. Includes Sulphur 30C to help with mental and physical fatigue. Sulphur helps the person who is impatient, yet lacks energy to move forward. Sulphur supports memory to lessen forgetfulness and poor comprehension. Sulphur is helpful when using wrong words, is confused, cannot seem to be able to concentrate or meditate. Sulphur helps when memory problems are accompanied by vertigo or headache. 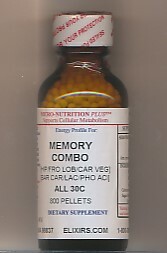 Memory Combo 30C in an economy 1 oz bottle of 800 pellets with 265 doses. Pellets are in a base of sucrose and cornstarch. Combination formulated by Kathryn Jones Homeopathic Specialist. Memory Combo can be used for any age. SUGGESTED DOSE: Slowly chew or dissolve orally 3 to 6 pellets as one dose. Repeat dose 1 to 3 times daily.